I was invited to join a group of fellow patrons to view an open rehearsal presented by Annabelle Lopez Ochoa, an award-winning freelance choreographer based in Amsterdam. Annabelle has choreographed for over 50 companies throughout the world. I walked into the Washington Ballet’s rehearsal space, sat down on a folding chair in the front row and waited for something to happen. A round, white plastic table stood alone in the middle of the studio. Now, four dancers leapt onto the floor and circled the table. They leaned forward, eyes locked, as though having a heated dispute. They backed away then returned to the circle, submissively resting their heads on the table, one on top of another like a human totem pole. They broke apart and circled the table again, slapping their hands on it, brushing their legs across it and lying precariously on top, always keeping their eyes fixed upon each other. As the music softened, so did the dance. Reaching out, embracing each other, the dancers reconciled. Suddenly the music was strong again. The dance turned on itself, breaking apart and returning again to start a new conversation. What was the music that inspired this dance? Music that seemed to move in and out, then repeating the circle again? I asked Annabelle for the answer. Schubert’s String Quartet No. 14 (Death and the Maiden). She began with the music and created the dance around it. Just as the melody changes pace, always returning to the major theme, so do the dancers change the mood from rapport to confrontation and back to the status quo. The round, white plastic table becomes an integral part of the dance. It speaks, not only to the circular nature of human interaction but to the notion of equality. No one sits at the head of the table. No one loses. No one wins. They just keep on dancing. 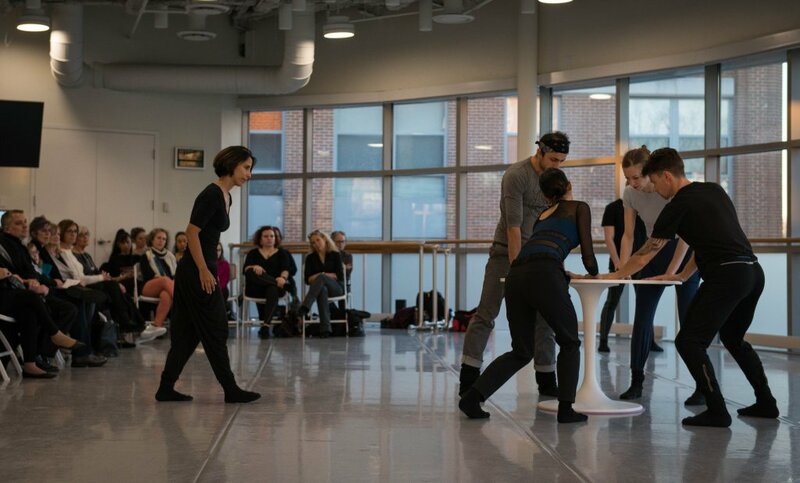 Annabelle Lopez Ochoa is creating a new work for four Chamber Dance Project dancers (and an IKEA table) with the first movement from Schubert’s String Quartet No. 14 (“Death of a Maiden”). CDP’s string quartet will accompany the performance. Costumes will be designed by Bekah Nettekoven-Tello and the lighting by Maja White. The world premiere will be Thursday, June 20 at Sidney Harman Hall.